Yesterday Dave Ryding wowed us all by coming second in the World Cup Slalom in Kitzbühel, and in doing so matched Great Britain’s best ever Alpine World Cup result. It was Ryding’s sixth top 15 finish of the season and Britain’s best result in an Alpine World Cup for 35 years, matching Konrad Bartelski’s second place in a Downhill World Cup in 1981. So if you were watching Ski Sunday thinking “I’d like to do that” — well, you can. Ski racing is for anyone, and can be done at almost any dry or artificial ski slope around the UK. Start your kids early and it’s just another fun activity that will be a bonus on family holidays — it doesn’t have to lead to a career as a ski racer, it can just give your children focus. After all, they might do tennis lessons, tap dance or piano — why should skiing be so different? Most dry ski slopes and snow domes in the UK have some kind of race club. Go Ski, Go Board is a campaign from Snowsport England, Snowsport Scotland and Snowsport Wales to encourage people back into snowsports — or into skiing or snowboarding from scratch. The campaign’s website goskigoboard.org.uk has a handy activity finder that allows users to search for an Alpine Skiing club (similarly snowboarding and freestyle) near them. “If you fancy giving ski racing a go, the best starting point (if you can already ski) is to join a ski club at your local slope or snow centre,” said a spokesman for Snowsport England. One example is The Snow Dome at Hemel Hempstead, which has a programme called Snow Stars at weekends 8am – 10pm. “This is for kids who have reached a good level of recreational skiing and are independent (using lifts etc),” says Pete Gillespie, head of snowsports at Hemel. “Our coaches then develop their all-round skills incorporating carving skills, basic freestyle, skiing variables etc. We are looking to build an all-round skier. Ben Moore, founder of family ski website Parallel Trails, is evangelistic about the benefits of ski racing for his children Seb, 14, and Ollie, 12. After a couple of family ski trips, the boys joined their local race club at Bowles dry slope in East Sussex. Every Friday night from 5.30pm they train for two hours. The club has members from the ages of six to 76, so they get to mix with a lot of different people and get technique coaching to hone their skills. “Seb and Ollie compete in slalom races in London and South East and Southern regions. This allows them to challenge for podium places against other skiers in their age group. It gives them a focus to their skiing all year round when they’re not on holiday with mum and dad. They love the challenge of pushing themselves and the chance of winning medals,” says Ben. 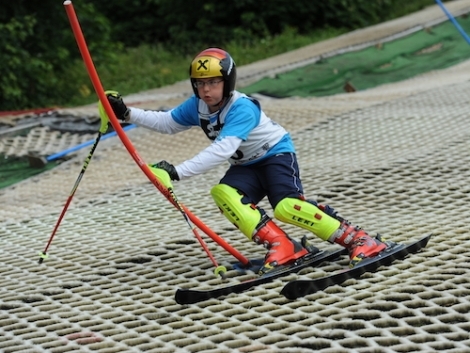 As well as regular club nights at slopes in the UK, there are also a number of junior race camps around the UK and in Europe, where your child can immerse themselves in ski racing for days at a time with others their own age. * Snoworks runs junior race camps during the summer and autumn on the Grand Motte Glacier in Tignes, as well as one-day sessions in the UK. * Alpine Training Centre runs camps in Scotland and across Europe’s glaciers. * Ski 2 runs race training camps for youngsters in the family-friendly resort of Champoluc, Italy. * Team Evolution runs camps around the UK. 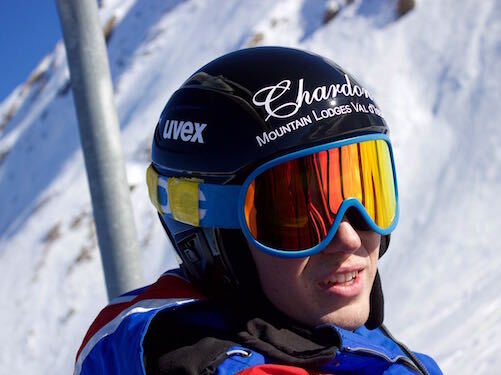 Zak Vinter, 18, is the current British U21 Slalom Champion and has recently received sponsorship from Le Chardon in Val d’Isère.